This kids utensil set will surely excite your little robot lover. Get ready for an exciting robot style mealtime! Stainless steel does not harbor germs. It does not break down easily, and lasts longer than plastic. Well balanced and perfectly sized for young children (2.5 years and up) entering pre-school. This set comes with 1 each of spoon, fork and butter knife. The flatware set is packaged in an eco-friendly and cute gift-box which makes it a great gift idea for birthdays and holidays. The fork is not sharp with rounded tine and the knife is non-serrated to keep the utensils safe for kids. This set is made of high grade 18/10 stainless steel which makes the flatware more rust-resistant compared to 18/0 stainless steel. 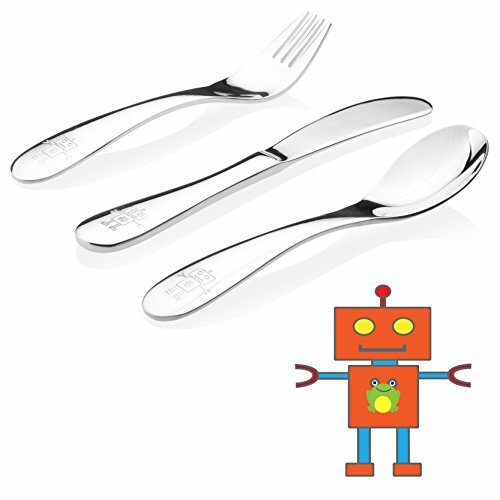 The utensils are all stainless steel and the robot engraving does not contain any paint materials or surface coating which could chip away and drop to food over time. This set could be used as keepsake because it will last a long time. Passed lab testing and certified to be lead free and cadmium free. If you have any questions about this product by Kiddobloom, contact us by completing and submitting the form below. If you are looking for a specif part number, please include it with your message.